Wildflower seeding is popular for clients looking to increase biodiversity or add a spectacular array of colour, shape and tone to their landscape and provides a wonderful habitat creation for the local wildlife. At Oliver Brown Ltd we are experienced in conventional hydroseeding and wildflower seeding, with technical knowledge from our in house agronomist and seed specialist. Each individual site and soil conditions needs to be carefully analysed to ensure the correct blend of species and seed mixture is applied. Soil amendments can be used to alter the soil characteristics to create the desired results. The species, colour, height, cost, climatic conditions and existing habitat need to be considered and we discuss these requirements with our clients making useful suggestions based on our extensive industry knowledge and technical experience. Accuracy is imperative, especially for some expensive wildflower seeds that need to be sown at less than 1 gram per square metre. The seed may be rolled into place to firm the seedbed back down and create soil contact with the seed, to maximise the germination, or sown more successfully using the hydromulching technique. Hydromulching guarantees even distribution of all seed type and sizes throughout the area. All members of staff are CSCS, CPCS, ROLO, NPORS and NPTC certified. This video shows the first application of a two-stage hydroseeding project to establish pure wildflowers at a quarry – 30,000m2 of butterfly and bee habitat creation. If you would like to discuss a Wildflower Seeding project in more detail, please contact us today by clicking here. Wildflower seeding is popular for clients looking to increase biodiversity or add a spectacular array of colour, shape and tone to their landscape and provides a wonderful habitat creation for the local wildlife. 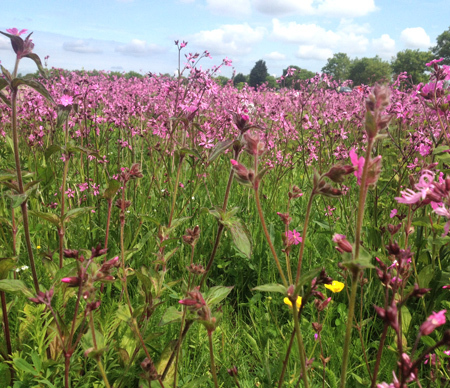 At Oliver Brown Ltd, we are experienced in conventional and wildflower seeding, with technical knowledge from our in house agronomist and seed specialist. Each individual site and soil conditions require careful analysis to ensure the correct blend of species and seed mixture is applied. Soil amendments can be used to alter the soil characteristics to create the desired results. There are two options when it comes to creating wildflower meadows, and both of them depend on the type of soil available. Perennial meadows are best for poor soils, as the grasses compete less with the wildflowers. Annual meadows require rich soils, and are a good choice when converting from a different type of lawn. If soil fertility rates are too high in your chosen area, a cornfield annual mix can be sown, including plants such as cornflower, corn poppy, and corn marigold. Many of these plants will flower within three months of sowing. Oliver Brown will work closely with the type of soil to supply you with a mixture of wildflower and grass seeds that will flourish in your given conditions. Our extensive knowledge of the industry means that we will help you select plants that won’t have a destructive effect on the environment and other species, leaving you with a perfectly seeded meadow. The species, colour, height, cost, climatic conditions and existing habitat need to be considered and we discuss these requirements with our clients making useful suggestions based on our technical experience. Wildflower seeding is best carried out during during March and April or in September, depending on soil conditions. Light soils can mean that seeds sown in the autumn germinate quickly, however some will not come through until the following spring. Heavy soils generally require seeds to be sown in the spring, so as heavy rain over the winter months does not waterlog the soil. Preparing the ground is a vital part of the process, and removing weeds or supressing their growth is highly advisable. The soil must be dug or rotovated beforehand, and then raked to make a seedbed for a new lawn. You must allow four-six weeks for the soil to settle down and for any weeds to germinate, and spraying these off before sowing. We also advise not to incorporate any manure or fertiliser as it encourages excessive vigour in grasses that can destroy the wildflowers. Accuracy is imperative, especially for some expensive wildflower seeds that need to be sown at less than 1 gram per square metre. The seed may be rolled into place to firm the seedbed back down and create soil contact with the seed, to maximise the germination, or sown more successfully using the hydromulching technique, which guarantees even distribution of all seed type and sizes throughout the area. Converting a lawn to a wildflower meadow can take several years, due to the balance between grass and wildflowers establishing itself. In the first year, continue mowing weekly to weaken the grass, and introduce some species gradually, as year-grown pot plants. Oliver Browns LTD has the knowledge and expertise required to help you with all your wildflower seeding requirements. All members of staff are CSCS, CPCS, ROLO, NPORS and NPTC certified.